When the sun goes down, it's time to break out the cards or board games and have some fun. It doesn't matter if you're tackling an intense game of poker or a family-friendly game of Scrabble, board game table furniture provides endless enjoyment and entertainment for the whole family. If you’re looking to upgrade your basement or game room, these rustic game tables are the perfect addition. It's rustic furniture with a spirit of gaming and fun. You can’t go wrong! At LodgeCraft, we have gaming tables of all sizes and styles. If you want an intimate game for two or a family-sized table for everyone, you'll find both options online and in our Montana showroom. If you’re short on space but want versatility, we offer a piece with a reversible top, so you can dine during the day and game during the night. So, what are you waiting for? 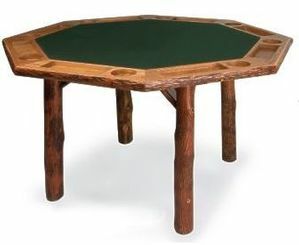 Make family time fun with the addition of a rustic game table that adults and children of all ages will enjoy. Start shopping our board game table furniture below!